In today’s society we notice the influence of media on the younger generations and how the ad may seem simple but advertising products are built to have hidden agendas (Eric 1988). In America the news and media have made it a point that obesity is a huge factor in the diet of American’s. We find that majority of people are over weight and this is all due to the laziness that products bring to life. There is always an easy way out when a hard task is at hand. On magazines, television, and new papers we have all seen the new Shape Up Shoes that claim to have an affect in your diet when you wear them. Though customers may have different opinions, the ad shows the obvious outcome of what these shoes can do. Shape Up Shoe ads are merely the beginning of breaking down ads but taking a magnify glass to the ad will surely break down the content, text, and picture angles (Fowles 1976). Just looking at the ad we can identify that placing Joe Montana presents an image of being in his shoes. Although most consumers won’t ever get close to his life style there are still the hopefuls that give into the shoes and buy what is paying for good advertising. Joe Montana is a young athletic man who is fairly good looking and it portrays an illustration of the future shape up owners. This is ad is placing Joe Montana on purpose to target athletic people and even if someone is not familiar with who Joe Montana is they will still see a handsome young man. This is just the coating on the surface of this ad but going in depth with this will prove to show how deceiving this ad is. At first glance the Shape Up Shoes ad seem to be straight forward as to how it catches its prospective buyers, but looking twice may be a natural reaction since the scenery shows to be beautiful. Joe Montana may catch the eyes of men due to his fame but the scenery is famous for catching the ladies eyes. Women naturally like to see nature in a striking way and what’s better than to have a man and surroundings such as the ones in the ad. When people go through magazines they often try to relate their lives to the ones in the pictures. This is why advertizing companies exaggerate the emphasis of beauty and glamour in marketing. If the picture does not grab you then the written proof will certainly pull you into the advertisement. In big letters across the front we see the page say “GET BACK INTO THE GAME,” which can define life as a game. We often find ourselves playing games in love, work spaces, and in family but having it promoted in magazines only makes you wonder if your still a game piece in the game of life. Do Shape Up Shoes really put you back into the game of life once you have fallen off? Maybe having these shoes will allow you to look better, therefore your outlook on life will improve and your game strategy will change. Its no lie that life is a struggle but this ad implies that it will help you get back in there and enjoy it once again. Speaking of enjoying life we can also identify a smile on Joe Montana’s face, which only backs up the joy in life these shoes bring to customers. Being that all this could occur with just one phrase one can only for see the corrections these shoes make in life. Looking into other written material we see that these shoes are promising to burn more calories, tone muscles, improve posture, and reduce stress in back and legs. If one pair of shoes can do all this, wouldn’t you want them too? It’s hard to say no to a pair of shoes that could do so much. The obesity in America is so high that anything that can possibly help that fact would make consumers dive into it. If you think about it having more calories being burnt that what you’re having being burnt now sounds good right? It’s like having double the workout without having to do double the work. Also to have your muscles toned seems nice, especially since appearance is a great factor in where your life can lead you. Being in shape and healthy can draw the fine line to getting a job or finding Mr. Right. Any woman would jump into this for a better body. Women are most definitely concerned of their looks since they go through ups and downs in their lives. Having good posture is probably the least important on the list of wonderful things these shoes can do but it is also a difficult thing to teach one to do. Having good posture is the most taught to teach especially in children, which leads to show that these shoes are almost universal to all ages and genders. Finally the ad promises to lower stress in your legs and back. What makes this strange is the not many people are aware their legs and back can be stressed but they do know that their backs and legs ache. Using the word stress exaggerates the need to reduce the strains. Although it may seem clever it only makes people wonder how these shoes work (Lutz). What is it that makes these shoes do all this and still look good enough to wear on in public? This brings us to the website that is written in the corner. It seems as though the ad does not have enough room to advertise the greatness of this product therefore it results in putting it on a website which will in turn present you with more appealing factors to purchase these Shape Up Shoes. These shoes are so great that they even have a website, this allows the consumer know that they are not a beginning product this product has worked which has lead to the making of a website. Notice that the only thing that is not shown in the ad is the pricing. After looking at the pricing it was obvious why this factor is not placed on the front page in bold letters. These shoes are nearly a hundred dollars for one pair. Now if this economy was doing wonderful we could understand the huge price tag but seeing that society lacks jobs and income, the advertisers for the Shape Up Shoes have found it necessary to hide the price. People these days are looking for bargains and this is not exactly a bargain. Having Shape Up Shoes are something a person wants but does not need therefore this ad is trying to make the amount of want in an individual go so high that regardless of price they will charge it just to have the image in the picture. This advertisement was obtained from inside a people’s magazine. Majority of this ad is covered with Joe Montana wearing a baby blue Sketchers Fitness Footwear jersey looking like a stud with the Shape-ups shoe in his right hand. The background of Joe Montana is a cloudy sky, which is a technique to draw the viewers into Joe Montana and the product. Joe’s face looks really bright, which brings joy to his personality when he’s carrying the shoe. 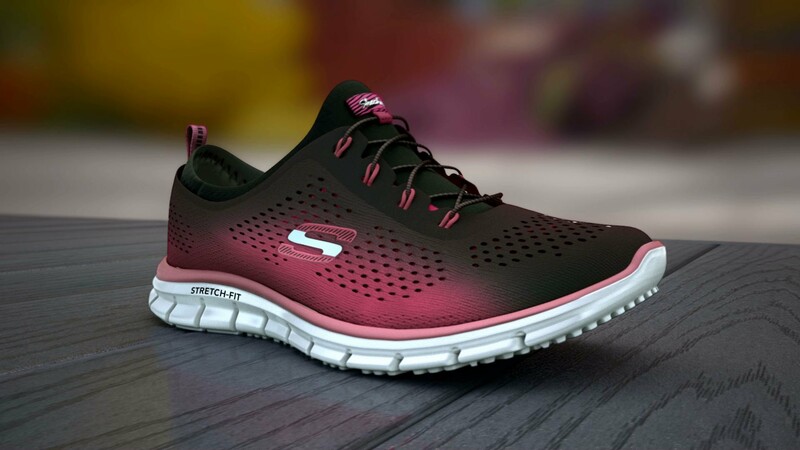 The visual content, text, and angle and vantage point of a Shape-ups Sketchers advertisement indicates getting back on your feet and staying in shape can be achieved by purchasing those shoes. The visual content of the whole advertisement displays Joe Montana and the Sketchers shoe that can help you stay in shape. Sketchers Shape-ups used Joe Montana as quarterback in this ad, but instead of a football, he is pretending to throw a Sketchers shoe. The fact that he’s wearing a Sketchers shirt makes him look like an athlete that wears that shirt to work out and dedicates him to Shape-ups shoes. The fact that they chose him as a role model for a lot of elderly men is very important because he gives them hope to have another shot to a healthier life by purchasing these shoes, and start walking without any form of athletic exercise but in reality, as a football player, I know how hard it is to get back in shape and have a lean body. The bigger message behind then content is you can have hall of fame, live as a legendary athlete, or even make millions of dollars. The text they chose to use is very influential because of the important facts and visual effects to tie back to the product. If this ad didn’t have any text on it, I would not be able to tell the difference between the products but when viewing this ad with all different colors, it made it stand out from any other simply because they used red on white and blue to convey cool and intense feeling to grab their audience’s attention. Besides the Joe Montana text, he signed his name so the audience can recognize his fame. They also used facts such as “Designed to help”, “burn more calories”, “tone muscles”, and “improve posture to reduce stress on back and legs”. As Ewen proposes for effective ads, when it comes down to angle and vantage point, Sketchers advertisement portrays higher value power over the audience. Since they took a low angle shot, it indicates that Joe Montana has a higher power and we are looking up to him because he was a leader from NFL. This technique also conveys the idea that they could put their feet in Joe Montana shoes and be an athlete. We are more attracted to products that are offered by celebrities. This image is definitely exaggerated since Joe is holding a shoe instead of a football. The only thing that is different in the background is the cloudy sky, other than that; the foreground is all Joe Montana with a shoe. Using content, text, and angle and vantage point, Sketchers has been persuading their audience to purchase the shape-ups shoes by using celebrities such as Joe Montana that was a former quarter back for NFL. This is one the best methods to demonstrate that shoes can do an outstanding task without putting any pressure on your body. In my opinion, wearing spectacular shoes does not make you “Burn more calories” or “Improve your posture” that is why we have gym and personal trainers to help us obtain that goal over a long period of time.